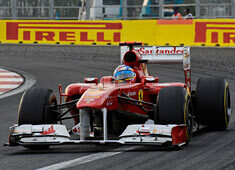 Eighteen points for Scuderia Ferrari in the Korean Grand Prix, thanks to a fifth place finish for Fernando Alonso and a sixth for Felipe Massa. Both Ferrari men made two pit stops, running identical strategies in terms of their use of the Pirelli tyres: Supersoft for the first stint, Soft in the second and third. After the sixteenth round of the Championship, the team and driver positions remain unchanged in their respective classifications: Fernando is still third in the Drivers’ with Felipe sixth, while the Scuderia occupies the lowest rung of the podium in the Constructors’ table.